Some people do not want to visit caves or mines but prefer man-made structures such as tunnels, nuclear bunkers, follies and so on. A specialist group, Subterranea Brittanica, caters for these interests. 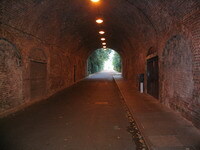 Mines such as the chalk mines at Chislehurst that were then used as mushroom farms and air raid shelters. Caves such as Peak Cavern that was used as housing and as a rope manufactory. Specially mined sites such as the underground factory at Drakelow. Cut and cover sites such as the grottoes popular in many country parks such as Stourhead in Wiltshire. Some of these sites are quite safe to visit but others are quite dangerous as they do not have natural ventilation and asbestos was widely used in wartime buildings. There is more information about places you might visit and some pictures in the gallery. This is not a recommendation for you to visit any of these sites, this is just for information.